Frassetto, Lynda 2018. Another strategy to help counter the effects of low gravity?. The American Journal of Clinical Nutrition, Vol. 107, Issue. 5, p. 681. 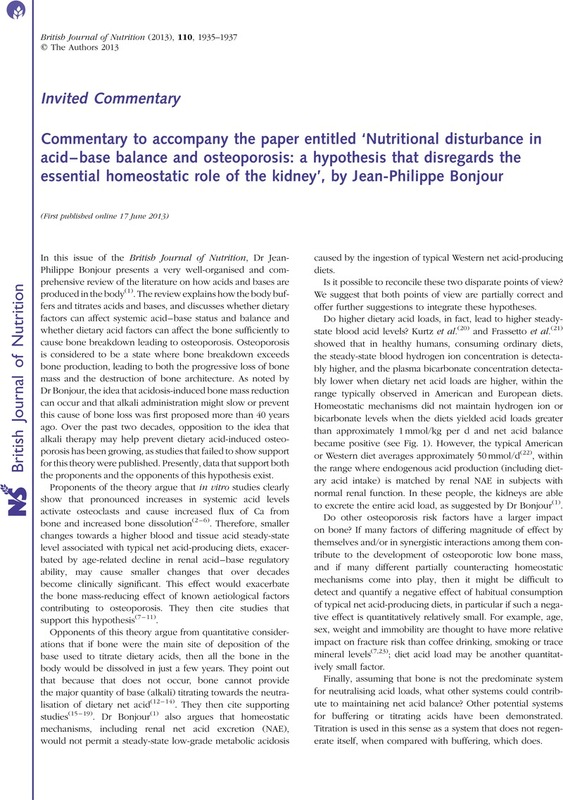 1Bonjour, J-P (2013) Nutritional disturbance in acid–base balance and osteoporosis: an hypothesis that disregards the essential homeostatic role of the kidney. Br J Nutr 110, 1168–1177. 2Barzel, US (1969) The effect of excessive acid feeding on bone. Calcif Tissue Res 4, 94–100. 3Arnett, TR & Dempster, DW (1986) Effect of pH on bone resorption by rat osteoclasts in vitro. Endocrinology 119, 119–124. 4Bushinsky, DA & Frick, KK (2000) The effects of acid on bone. Curr Opin Nephrol Hypertens 9, 369–379. 5Bushinsky, DA, Smith, SB, Gavrilov, KL, et al. (2003) Chronic acidosis-induced alteration in bone bicarbonate and phosphate. Am J Physiol Renal Physiol 285, F532–F539. 6Frick, KK, Krieger, NS, Nehrke, K, et al. (2009) Metabolic acidosis increases intracellular calcium in bone cells through activation of the proton receptor OGR1. J Bone Miner Res 24, 305–313. 7Sellmeyer, DE, Stone, KL, Sebastian, A, et al. (2001) A high ratio of dietary animal to vegetable protein increases the rate of bone loss and the risk of fracture in postmenopausal women. Study of Osteoporotic Fractures Research Group. Am J Clin Nutr 73, 118–122. 8Wynn, E, Krieg, MA, Aeschlimann, JM, et al. (2009) Alkaline mineral water lowers bone resorption even in calcium sufficiency: alkaline mineral water and bone metabolism. Bone 44, 120–124. 9Shi, L, Libuda, L, Schonau, E, et al. (2012) Long term higher urinary calcium excretion within the normal physiologic range predicts impaired bone status of the proximal radius in healthy children with higher potential renal acid load. Bone 50, 1026–1031. 10Sebastian, A, Harris, ST, Ottaway, JH, et al. (1994) Improved mineral balance and skeletal metabolism in postmenopausal women treated with potassium bicarbonate. N Engl J Med 330, 1776–1781. 11Jehle, S, Hulter, HN & Krapf, R (2013) Effect of potassium citrate on bone density, microarchitecture, and fracture risk in healthy older adults without osteoporosis: a randomized controlled trial. J Clin Endocrinol Metab 98, 207–217. 12Oh, MS (1991) Irrelevance of bone buffering to acid–base homeostasis in chronic metabolic acidosis. Nephron 59, 7–10. 13Uribarri, J, Douyon, H & Oh, MS (1995) A re-evaluation of the urinary parameters of acid production and excretion in patients with chronic renal acidosis. Kidney Int 47, 624–627. 14Oh, MS (2000) New perspectives on acid–base balance. Semin Dial 13, 212–219. 15Macdonald, HM, Black, AJ, Aucott, L, et al. (2008) Effect of potassium citrate supplementation or increased fruit and vegetable intake on bone metabolism in healthy postmenopausal women: a randomized controlled trial. Am J Clin Nutr 88, 465–474. 16Frassetto, LA, Hardcastle, AC, Sebastian, A, et al. (2012) No evidence that the skeletal non-response to potassium alkali supplements in healthy postmenopausal women depends on blood pressure or sodium chloride intake. Eur J Clin Nutr 66, 1315–1322. 17Fenton, TR, Lyon, AW, Eliasziw, M, et al. (2009) Meta-analysis of the effect of the acid-ash hypothesis of osteoporosis on calcium balance. J Bone Miner Res 24, 1835–1840. 18Fenton, TR, Eliasziw, M, Tough, SC, et al. (2010) Low urine pH and acid excretion do not predict bone fractures or the loss of bone mineral density: a prospective cohort study. BMC Musculoskelet Disord 11, 88. 19Mardon, J, Habauzit, V, Trzeciakiewicz, A, et al. (2008) Long-term intake of a high-protein diet with or without potassium citrate modulates acid–base metabolism, but not bone status, in male rats. J Nutr 138, 718–724. 20Kurtz, I, Maher, T, Hulter, HN, et al. (1983) Effect of diet on plasma acid–base composition in normal humans. Kidney Int 24, 670–680. 21Frassetto, LA, Morris, RC Jr & Sebastian, A (2007) Dietary sodium chloride intake independently predicts the degree of hyperchloremic metabolic acidosis in healthy humans consuming a net acid-producing diet. Am J Physiol Renal Physiol 293, F521–F525. 22Lemann, J Jr (1999) Relationship between urinary calcium and net acid excretion as determined by dietary protein and potassium: a review. Nephron 81, Suppl. 1, 18–25. 23NIH Consensus Development Panel on Osteoporosis Prevention, Diagnosis, and Therapy (2001) Osteoporosis prevention, diagnosis, and therapy. JAMA 285, 785–795. 24Hood, VL & Tannen, RL (1998) Protection of acid–base balance by pH regulation of acid production. N Engl J Med 339, 819–826. 25Wesson, DE, Simoni, J, Broglio, K, et al. (2011) Acid retention accompanies reduced GFR in humans and increases plasma levels of endothelin and aldosterone. Am J Physiol Renal Physiol 300, F830–F837. 26Mahajan, A, Simoni, J, Sheather, SJ, et al. (2010) Daily oral sodium bicarbonate preserves glomerular filtration rate by slowing its decline in early hypertensive nephropathy. Kidney Int 78, 303–309. 27Mitch, WE, Medina, R, Grieber, S, et al. (1994) Metabolic acidosis stimulates muscle protein degradation by activating the adenosine triphosphate-dependent pathway involving ubiquitin and proteasomes. J Clin Invest 93, 2127–2133. 28Mithal, A, Bonjour, JP, Boonen, S, et al. (2013) Impact of nutrition on muscle mass, strength, and performance in older adults. Osteoporos Int 24, 1555–1566. 29Sebastian, A, Frassetto, LA, Merriam, RL, et al. (2005) An evolutionary perspective on the acid–base effects of diet. In Acid–Base Disorders and Their Treatment, pp. 241–292 [Gennari, FJ, Adrogue, HJ, Galla, JH and Madias, NE, editors]. Boca Raton, FL: Taylor and Francis Group. 30Lennon, EJ, Lemann, J Jr & Litzow, JR (1996) The effect of diet and stool composition on the net external acid balance of normal subjects. J Clin Invest 45, 1601–1607.